In order to use Git features, we will have install it first on our system. We can install it with apt-get package manager. The first command will update apt-get package manager with latest version of all software packages. second command will install Git on your system. Now Git is in Our system. We can check and Confirm Git with its version. Now time to configure it with Your Github account. In order to use it to add and edit commit on Github repository. Now time to setup git account on Ubuntu. 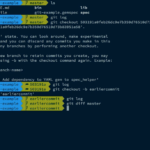 Git need proper information in order to allow add commit on remote git repository. Specifically, we need to provide our name and email address because git embeds this information into each commit we do.